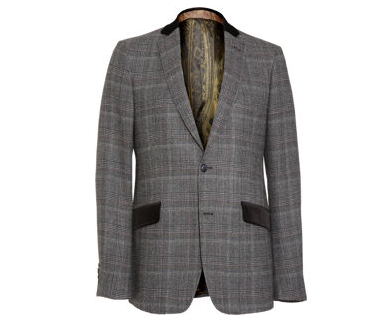 Etro comes through with another seasonal hit, in this plaid sportcoat. In a vintage dandy motif, the Italian made wool jacket, features notched lapels and velvet accents on the collar and pocket flaps. Lined with a wildly printed acetate/viscose blend, the witty Etro jacket, neatly tops off that early century auctioneer outfit, you’ve been working on. Available at Barney’s.